We are excited to announce that Home Leisure Direct are the official sponsor of Gareth Potts; 3 times world champion and World Number 1 ranked pool player. The UK's Number 1 Pool Table Retailer sponsors the World and UK's Number 1 Pool Player, what a fantastic partnership! Gareth has had an unprecedented career since becoming the youngest ever professional in 2000. 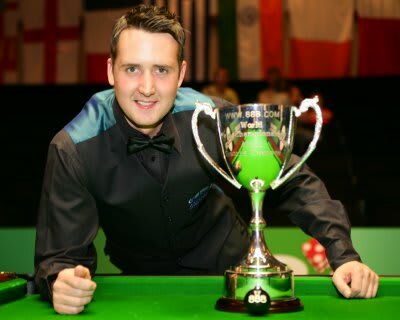 He has won a record four world 8 ball Pool tittles, the first as a junior in 2000 then the main senior world championships in 2005, 2007 and 2008.Gareth is the only player to have won the world title 3 times but Potts also holds another exclusive record when in 2008 in became the first person in the history of the sport to successfully defend his world title. A record said by many experts that will never be broken. He also holds the record for the most major ranking events ever won in 1 season which was no less than 7. Gareth started playing pool in his mum and dads pub ‘The Winchester’ standing on a beer crate to reach the table at the age of 7. Gareth’s life off the table has been far from easy, in 1997 aged just 13, lost his mum ‘Sandra’ to a long term illness. This in turn brought him and Dad ‘Dave’ even closer by this time all the hours of practise in the pub were starting to show and it became obvious that Potts had a unique talent on the baize. At such a difficult time he began to dedicate his life to his chosen sport and travel to tournaments with his dad. Three years later by the age of 16 Gareth was the most successful junior player in the world winning all 4 major titles in the year 2000; The world, European, British and English championships, as well as numerous team titles with the England team where he was captain for 3 years. Gareth’s number 1 fans, as quoted when he won his second world title, are his grandparents. He lived with 'Beaty and Arthur' for a while as a teenager and his grandma is like a mother figure in his life and have both seen him win all of his world titles. Gareth now lives with girlfriend Angie Layton and have been together for 7 years who he describes as his inspiration. Gareth is talented at most sports he plays, he had trials for Crewe Alexandra at football as a teenager and plays golf to a good standard. From an early age he as liked to keep fit so even now going to the gym is never a chore. Gareth sticks to a strict regime and often trains 3-4 times a week which he believes improves mental fitness as well as physical fitness. We are proud to have such a positive ambassador for Home Leisure Direct and are looking forward to a long relationship with Gareth and supporting him towards his next World Title. Just to whet your appetite here is Gareth clinching the 2008 World crown. With many more videos to come from Gareth, you can look forward to plenty of exclusive material, to both help you with your game and entertain you, whether it being during the tense atmosphere of a tournament match or bringing you a few great trick shots. We will also be running a number of competitons to win Gareth Potts DVDs and even the opportunity to get personal coaching form the man himself. So stay tuned, and get involved by following us on Facebook for all the latest updates and competitions.